The high priorities were good light, lots of windows for distant views, and high ceilings, and the studio needed to be raised. Having distant views is a good change for my eyes after I have been focused close up while working on a sculpture. It can prevent eye strain, as does good light. The high ceilings are necessary for sculpting monuments, and having the studio 4 feet off the ground allows for easy loading of a large, finished clay piece onto my truck once the clay is ready to go to the mold-makers. Describe the landscape outside your studio door. On the east side is a horse pasture that allows my horses to come right up to the studio. It also looks down to the Chama River and off into the mountains to Truchas Peak. My studio sits at the edge of the acequia (irrigation ditch) that runs in abundance six months of the year. Trees line the acequia, so it is a haven for birds, especially ravens, who visit me often. I chose this ranch much because it is right across from the Santa Fe National Forest and near spectacular and colorful country, with everything from tall pine forests to wide-open canyons. They are all great for exploring on horseback. I am able to ride every day, which provides good exercise, mental downtime, and spiritual uplift. It’s a wonderful way to balance out the intense time in my studio that sculpting requires by using a different part of my brain. What kinds of wildlife do you see on your ranch? The wildlife that is visible includes birds, coyotes, and jack rabbits. The most abundant are the ravens. They interact often with my dogs, which can be quite entertaining. Red-tailed hawks nest in the bosque near the river annually, so we often see the young ones flying around and calling with their distinctive cry. On rarer occasions, bald eagles and great horned owls will appear. I see lots of brilliant blue pinyon and Steller’s jays when I ride in the Santa Fe National Forest, and sometimes deer and elk. So far, I’ve never caught a glimpse of mountain lions, bears, or bobcats, but I see their tracks. The coyotes are often seen as well as heard. They like to raid my apple orchard throughout late summer, fall, and winter. Do you listen to music in the studio? I do listen to music often, and a wide variety, although mostly Mozart and instrumentals. I sometimes listen to audio books. The books I like to listen to while working have to be very story-driven and with clearly defined characters since my attention for the book moves in and out as my work demands. Examples would be Diana Gabaldon’s Outlander series and Lonesome Dove by Larry McMurtry. That seems to vary day to day. I continue to be drawn to sculpting strong Indian women, cowboys, horses, and wildlife. My interest is usually sparked by an experience that has caught my attention. What attracts you to western subject matter? I am originally from the East Coast, but I have been in New Mexico for almost 30 years. Maybe it is because I grew up in a different environment that I find the western idiom so alluring, endlessly interesting, and a bit exotic. What do you keep in your studio? Mostly I have photographs of wildlife, cave paintings, and my horses. John Coleman, Glenna Goodacre, Frederic Remington, Charles Russell (particularly for his humor), Anna Hyatt Huntington, Solon Borglum, and Malvina Hoffman, to name afew. What accomplishments are you most proud of in your career? I am particularly proud of the one-person show I had at the Gilcrease Museum in Tulsa, OK.
It’s unlikely you’ll ever find me at McDonald’s or Burger King. What do you enjoy doing when you are not sculpting? I love riding my horses, hiking with my dogs, and watching movies. Where do you like to take people when they come to visit? I like to take visitors up to Ghost Ranch to hike up to Chimney Rock or out to a favorite restaurant. If they ride horses, I will often take them to Copper Canyon here in Abiquiu. 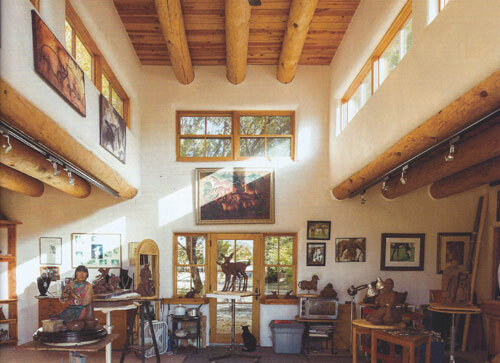 Manitou Galleries, Santa Fe, NM; Sorrel Sky Gallery, Durango, CO; Medicine Man Gallery, Tucson, AZ; Broadmoor Galleries, Colorado Springs, CO; Signature Gallery, Scottsdale, AZ; K. Newby Gallery, Tubac, AZ; Guarisco Gallery, Washington, DC.